Merry Christmas! I have been recycling old Christmas cards into ornaments for years. I just love taking the beautiful old cards and repurposing them. It is very easy and children especially can enjoy recycling the cards and crocheting around the edges. 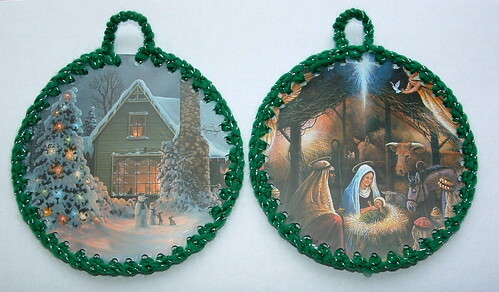 Here is the instructional tutorial on how I recycle the cards into these ornaments. Also be advised that if you don’t want to crochet around the card edges, you can always use a craft needle and yarn to whip stitch around the edges for decorating. This is my how-to for making a bookcover using cloth fabric. 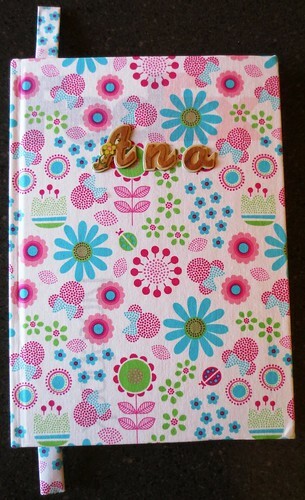 I had this nice promotional journal that I wanted to cover and give to my granddaughter. So I purchased some fabric in her favorite color and set out to make a cloth covered bookcover. Go slow and measure your fabric several times to make sure it is cut even for each side and edges. Fold fabric over and see how it lays before applying glue. Glue in sections and add extra glue to secure fabric edges once you have the fabric smooth and flat. Let glue set up before you start a new side. Remember slow is better so you don’t get your fabric wrinkled. Put a heavy book on top after gluing so the fabric bonds nicely to the book. Cut the fabric at the top and bottom of the book spine so just a little piece is left to glue under at the spine edge. I was thinking about my recycled craft projects and as I was recycling some old Christmas cards, I thought of a great Christmas greeting. Merry Christmas the recycled way! It sums up what I think about much of the time and a fun message this time of the year. Here are recycled Christmas cards I crafted into ornaments. 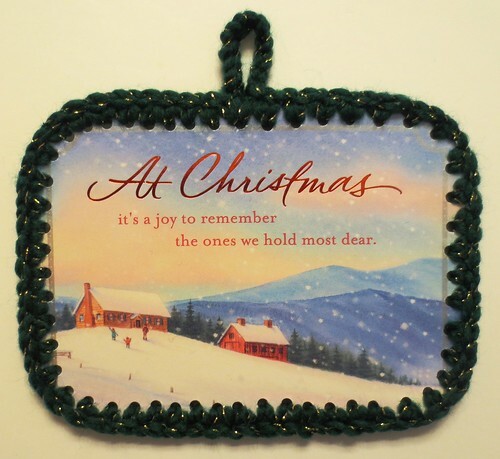 These are promotional cards mailed out to advertise Christmas cards that can be ordered. I glued the cards back to back to hide the advertising on the reverse sides of each card. The cards are so pretty and different companies mail out several sets to us each year. 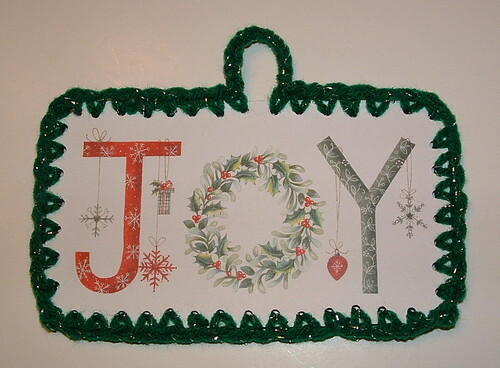 By cutting out shapes from the cards and using a big craft needle and yarn, these make beautiful Christmas ornaments. This is a recycled craft that children especially can enjoy as you just need to stitch around the holes and tie a long strand of yarn at the top for a hanger. 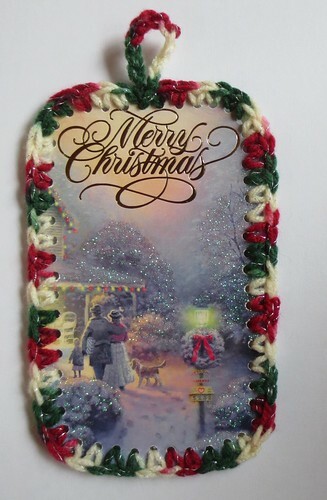 Here is another style of trim I made by crocheting around the edges of the card using a small C crochet hook. 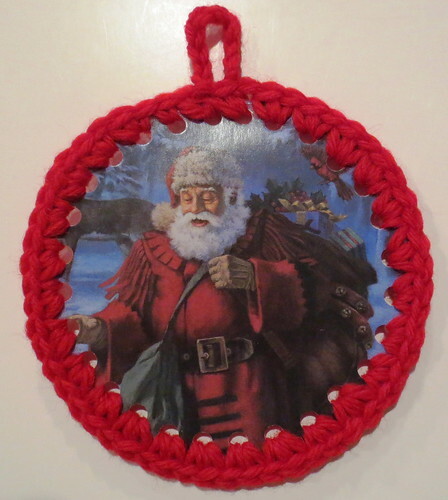 I did 2 single crochet stitches in each hole and just worked my way around the ornament. The small crochet hook works best as it fits through the punched holes. Here are a few Christmas ornaments I made from old recycled Christmas cards. I save Christmas cards and those sample cards you get in the mail. I cut out to shapes and glue them together. You can either make them bigger for decorating on a tree or package. You can also make smaller ones that can be used as gift tags. For more details on the process you can read my original craft post on Recycling Christmas Cards into Ornaments. 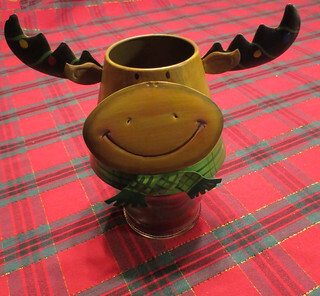 Well it’s nearly Christmas and I just wanted to share this tin moose candle holder. Isn’t he cute? Anyway I just wanted to take this time to wish everyone a very happy and safe holiday. I’m just finishing up my last crafting for the holidays and it’s time to start cooking. Oh and relaxing too. Well it’s nearly Thanksgiving and I was browsing around and found several cool recycled turkey craft ideas. 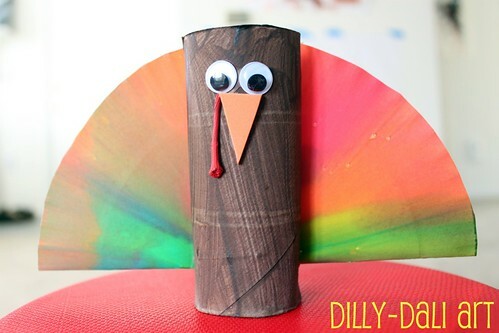 Check out this cute turkey using a recycled toilet paper roll from Dillydaliart. Here is a turkey place card you can make using recycled paper such as postcards or lightweight cardboard. 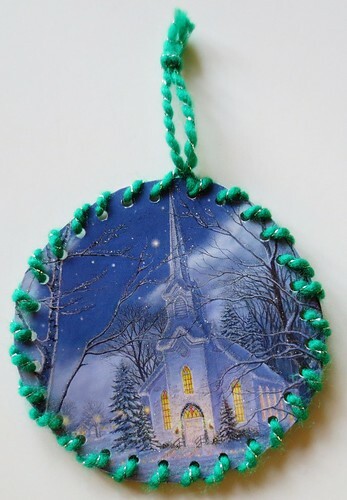 I recycled a few more old Christmas cards into Christmas ornaments. This time I made 4 inch round ornaments from some old cards I have been saving. I used a small bowl from the kitchen to make the round circle. I just placed the bowl over the part of the card that I wanted to cut out. It worked well to place it so I could see if I was capturing all the area I wanted for the ornament. Then I just traced around the edge of the bowl with a pencil and cut out the circles. I like to save old Christmas cards to recycle them into new and useful items. In my recycled gift tag post, I cut them to create cute little gift tags that can be used on packages. This year I wanted to use the old cards to create some Christmas ornaments that I could send along to the troops overseas. 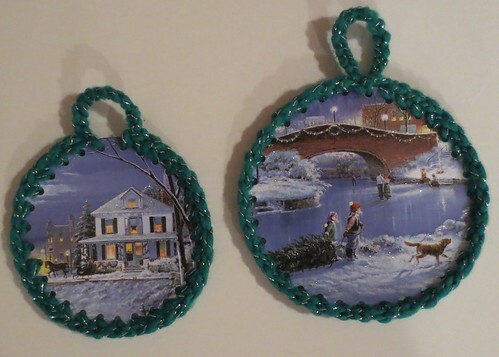 I know they may not have a tree but they could hang these little ornaments on a knob in their vehicle or hang it in their living area. Maybe the small decoration would remind them of Christmas and bring them a little joy for the holidays. Hello, I’m Cindy or aka RecycleCindy. Welcome to my blog site that is dedicated to recycling and crafting. I love to crochet and create crafts and other useful things from recycled materials. I share many free tutorials and patterns for creating recycled projects as well as other handmade items. Here is a direct link to all my free patterns available here on My Recycled Bags. Thank you for stopping by to visit and for your interest in My Recycled Bags! © 2012 My Recycled Bags.com - Powered by Wordpress.